Some years ago, in several cities on different continents, groups of people started to organise themselves differently – beyond their institutional frameworks – to create knowledge about how cities possibly could evolve in the future using co-production approaches. They began to share their insights across continents, learning from each other what particular local contexts could offer. 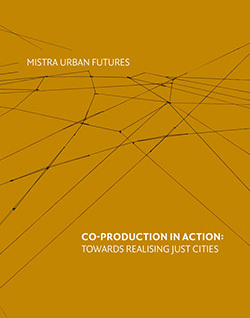 These knowledge-transferring group of people grew into the unique international collaboration that is Mistra Urban Futures. If you are interested in how urban change can work towards realising a more just society in a world as challenged and challenging as ours, the book Co-production in action: Towards realizing just cities will take you one step in that direction. Its contributors share their stories of how they developed, and are constantly reworking, their methods for addressing the complexities of the urban environment. You will not be given the answers to what could be a sustainable solution to a specific urban problem, but it will take you into a discussion of how possibly to create new knowledge for difficult emerging urban challenges. The book has been edited by Henrietta Palmer, Deputy Scientific Director, Mistra Urban Futures and Helen Walasek, freelance editor, writer and researcher, and has over thirty contributors. This is a book for people who are curious about transdisciplinary work on urban development. It offers insights and experiences from different local urban context – from the global North as well as from the South. It speaks about the difficulties and benefits of co-produced research within this field, and is aimed as a source of inspiration for all of you who are engaged in how to formulate a possible urban agenda towards the realisation of just cities, says Henrietta Palmer. The book will be launched on the Realising Just Cities conference, 19-20 September in Gothenburg.